The $499 Ultron 40mm f2 SL II Aspherical is a standard focal length prime from legendary Viennese manufacturer Voigtlander. Despite its tiny proportions it promises to deliver excellent image quality scores in our industry standard lab tests. With the lab data in, recorded and verified our in-depth review analyses the results. The Pentax 40mm f2.8 Limited is one of two pancake type lenses from the firm and although this model is just 15mm in length it’s actually the larger of the pair. Read on to find out how well this refreshed HD version performs. After achieving an excellent reputation for its imaging characteristics, Sigma has revised this popular high-speed APS-C format standard lens, adding it to its high-performance Art line. Read on to see how well this new iteration performs in our labs. With its compact and lightweight body, the Canon EOS 100D / Rebel SL1 / Kiss X7 is the smallest DSLR in the firm’s line-up. While it adopts a similar performing sensor to the EOS 700D, the body is around 25% of the size of that model by volume and presents its own set of challenges when selecting lenses for it. In this review, we’ve taken a look at the optical quality of 130 different lenses fitted to the camera but this time we’re also making some limited recommendations about the handling and video capabilities. Our review of the Canon EF 40mm f/2.8 STM lens. In the latest of our lens reviews brought to you in partnership with DxOMark, we take a look at Canon's slimline 'pancake' prime for its APS-C and full frame SLRs. It's one of the smallest and cheapest lenses currently on the market, and includes a stepper motor for silent focusing during movie recording. But does its small size and low price result in compromised optics? Read our review to find out. 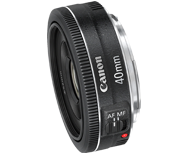 Announced this past June alongside the Canon EOS Rebel T4i DSLR camera, the new Canon EF 40mm f/2.8 STM is an ultra-slim, entry-level pancake lens that uses Canon’s Stepping Motor Technology (STM) to enable extra-quiet continuous autofocus, making it well-suited for video shooting.